As technology continues to grow and change around us, Multimedia is an ever-evolving mechanism of storytelling. As we are all discovering, that may come in many different shapes and platforms to maximize how we understand and effectively absorb the material. 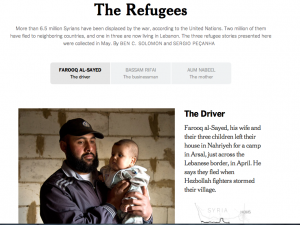 I found the NY Times article Syrian Refugees in Lebanon to be a very powerful and contextualizing form of multimedia. Now this is not quite a form of “Snowfall” but it provides us with a great example of a smaller scale and more simplified version of the same general idea. The Times presents stories from three different families who have been fled from Syria to Lebanon in attempts to escape the horrors they left behind. I particularly like the interactive photograph of the families in their home because it allows the viewer to see an entire 360 degree view around the room (oftentimes the only room shared amongst multiple families). It gave me a sense of perspective on exactly how big the room was and how many people were sharing that space on a daily basis. Overall, I think this is an effective piece of Multimedia Journalism and left me with an overall feeling of empathy for these people that have lost their homes to warfare.